Fermilab's Daughters and Sons to Work (DASTOW) day takes place during the first half of today. Families can enjoy a Fermilab Fire Department demonstration and a Mr. Freeze demonstration outside of Wilson Hall during lunch. Those registered can also see physics demonstrations on the 15th floor of Wilson Hall and science presentations in One West. Lunch will be offered in the Wilson Hall atrium. For a full schedule of events, visit the DASTOW Web page. Tuesday, July 7, noon-1 p.m.
Wednesdays. Depart from Wilson Hall east side at noon. Time, distance and speed are up to you. Register online at Jeff Ellis Management. Session II, July 6–16, Monday-Thursday. Register by June 29. Session III, July 20-30, Monday-Thursday. Register by July 13. Session IV, Aug. 3-13, Monday-Thursday. Register by July 27. 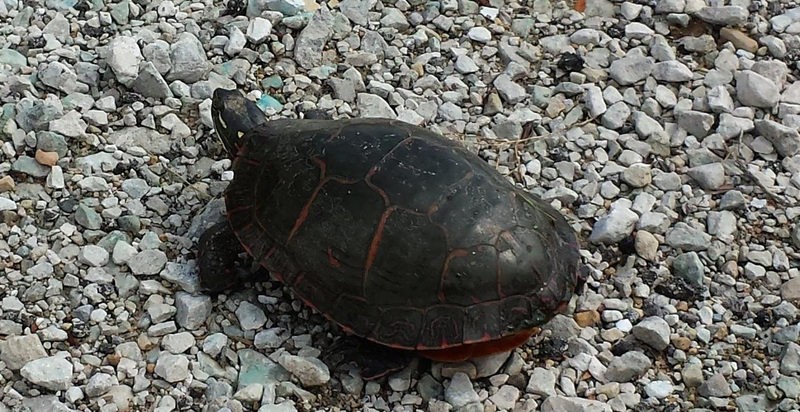 Mondays, July 20-Aug. 31, noon-12:45 p.m.
$87. Register by July 13. Interested in go, baduk or weiqi? New, beginner, and experienced players are welcome, Player strength ranges from beginner to 1 kyu. Bring a board if you have one. Contact O'Sheg Oshinowo for more information. Visit the employee discount Web page. Michell's 1784 treatise languished in quiet obscurity until it resurfaced in the 1970s. By then, theoretical physicists were well acquainted with black holes — the dark star idea translated into Albert Einstein's theory of gravity. Black holes have a boundary called an event horizon that represents the point of no return, as well as a singularity, a point of infinite density within. 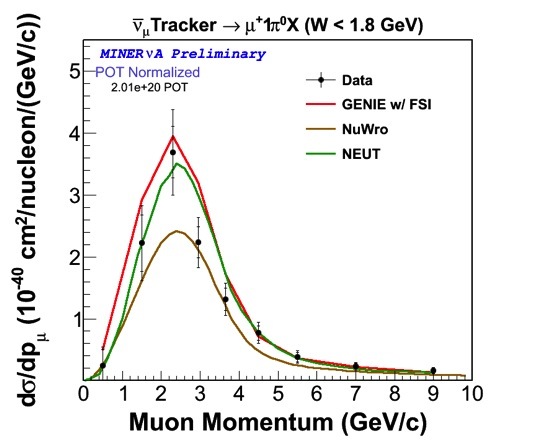 This plot and the one below show the differential cross sections (or likelihood per proton or neutron) for a neutrino to make one or more pions and a muon with respect to the muon momentum, with a few different models used by neutrino oscillation experiments. This plot is for events in which charged pions are made by neutrinos. The plot below is for events in which neutral pions are made by antineutrinos. The two different models represent turning on and off the effects of the nucleus where the neutrino interacted. The data clearly represent the effects of the nucleus being "turned on," and the two different predictions have the same shape. The inner error bars are statistical and the outer error bars are the total uncertainties. It can be hard to detect the ghostly neutrino, which rarely interacts with matter. To overcome this, neutrino experiments use detectors made of neutrons and protons bound up in heavy nuclei. 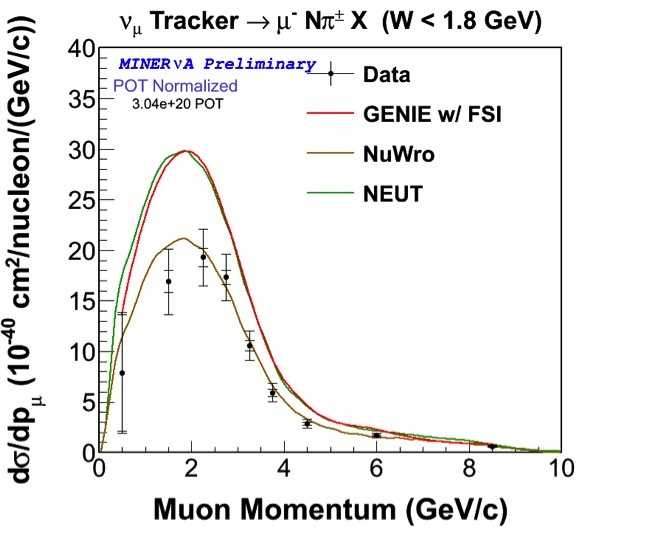 The way these nuclei affect the particles made by neutrino interactions is not well understood, so MINERvA is working to measure this in as many ways as possible. Sometimes a neutrino creates a quark-antiquark pair called a pion, and the neutrino itself can change into a charged particle called a muon (an antineutrino can create an antimuon). 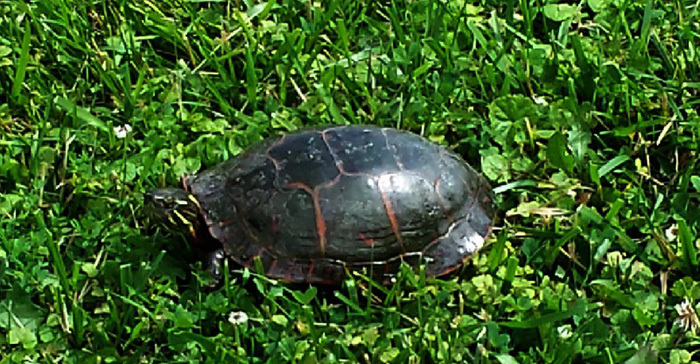 The pions often interact with the nucleus where they were made, changing their charge or even stopping before they can leave. 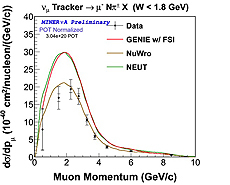 On the other hand, the muons or antimuons are not affected by the nucleus at all, according to predictions. So one way to measure the effects of the nucleus is to take the same interaction and look at it from both sides: from the pion side and from the muon side. 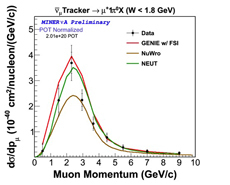 MINERvA presented results about the pion side neutrino measurements and the antineutrino measurements. At today's Joint Experimental-Theoretical Physics Seminar, the MINERvA collaboration will show new information about the muons that are made along with the pions in these interactions and provide a more complete picture of the interaction. There are models that try to describe this process. Neutrino experiments, especially those that try to measure how neutrinos change over time, need those models to get both the muon side and the pion side right: It's not enough to describe only one kind of particle. Creating these models has been a challenge due to the complicated nature of the nucleus. In addition, there are disagreements between these models and the experimental data taken by many neutrino experiments. To make matters even more confusing, sometimes different measurements of this process at different energies (or on different nuclei) don't all agree with the same model. By studying the muons as well as the energies of the pions, we can compare between the different models of the nucleus and their effects on the interaction. Eventually there will be at least one model that can describe all the data. This will give us a better picture of the nucleus, which ultimately improves our ability to measure the neutrino. This plot shows the cross sections described in the top figure caption with several models. The cross sections here are shown for antineutrinos and neutral pions (instead of for neutrinos and charged pions as in the top figure). Carrie McGivern of the University of Pittsburgh worked on this analysis and will present the results and more at the Joint Experimental-Theoretical Seminar today. Neutrinos are often called "ghost particles," and for good reason. Neutral in charge and tiny in mass, neutrinos are incredibly elusive and mostly pass unnoticed through ordinary matter, including you and me. In fact, neutrinos, one of physics' fundamental particles, were once thought to be completely massless. A recent observation from researchers in Italy, however, adds to mounting evidence however that neutrinos do have some — very tiny — mass. Specifically, it was found that neutrinos, which come in three varieties or "flavors," can spontaneously change their flavor in a process known as oscillation. And because of the nature of quantum mechanics, oscillation only occurs if the flavors have unique masses.